How Do I Extend The Battery Life Of My Electric Scooter? If you have gone ahead and bought one of these top battery powered scooters and now want to look after it properly, you have come to the right place. Welcome to our top tips on how to take care of and maintain your electric scooter's battery. Your electric scooter battery is among the maintenance items that you should check on a regular basis so that your rides will start without a hitch and also perform exactly how you expect. Whenever you are leaving your scooter for several weeks without riding, a good idea would be to get a battery tender. Contrary to what most people think, the 12 volt batteries aren’t really 12 volts! Normally the twelve volts is just a nominal convenient term that manufacturers use to distinguish one type of battery from the another. A fully charged 12V battery allowed to rest for several hours or even days without any load drawn from it will balance out the charge at around 12.6 volts between its terminals. You should consider any battery that is reading exactly 12V under such conditions as almost fully depleted. A battery with a resting voltage at exactly 12.0V or even 12.1V means that only around 20-25 percent of the useful energy remains. The battery will either be already dead or you will have already deep cycled it too many times and it won't last for much longer. Moreover, you can only deep cycle your battery for a limited number of times before it will completely die. A 12V battery can only supply useful energy through a limited range. When fully charged the battery will supply from above 14 volts down to around 10.5 volts in use or under load, when the lights are on or when starting the scooter. Unless the battery is still being charged, it won’t remain in the 14V range for more than a few seconds. The lowest charge limit is 10.5V. This limit is useful in testing but it is unsatisfactory in practical uses. When your scooter isn’t starting, you probably do not need to look beyond the battery for the source of the problem. Little checks and periodic maintenance may go a long way to extend your battery life. Changing a battery is sometimes out of the question as the fact that the battery of a scooter can be in an awkward-to-access location readily deters most riders from troubleshooting. With a few minutes of maintenance each and every month, you will be able to keep the scooter battery working perfectly and also increase its durability. Whenever the lights start dimming, the starter is sounding weak or the horn is sounding wimpy, you should charge the battery to 100%. And if you haven’t used the battery for a period of 2 or more weeks, you should recharge it before reusing it. Before you remove the battery from your scooter, you should remember to put on protective goggles or glasses and rubber gloves. 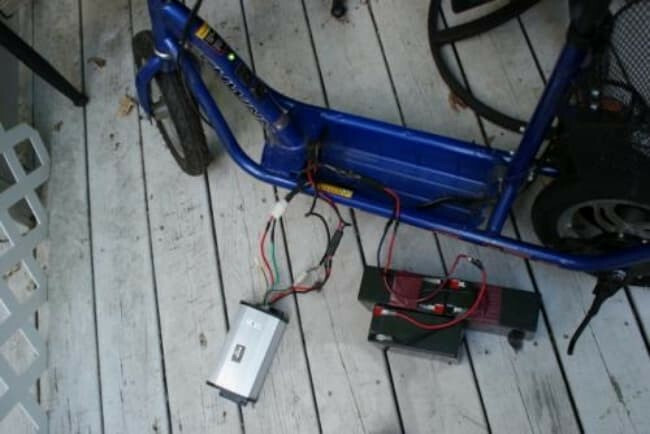 To remove the battery from the electric scooter, you have to spray it with a battery cleaner and then use a screwdriver to disconnect the negative (-) wire first before proceeding to the positive (+) wire. After removing the two wires, you should remove the battery belt or strap and pull the battery out slowly to prevent catching of the overflow tube. Now take the battery you have disconnected to a clean place and remember to place it on some newspapers. Before opening the caps on your battery’s chambers, clean its top to eliminate any grime or dirt. If you happen to notice any corrosion on the terminals use a wire brush to clean them properly. Use a dry cloth to wipe the dirt and filings and then spray a battery cleaner on a lint cloth and use it to wipe the two terminals. If the overflow tube seems to be kinked, dirty or clogged, you should remove and clean it by spraying the battery cleaner through the tube. To ensure that the overflow tube is completely clean you should run hot water through it and blow the water out using compressed air. 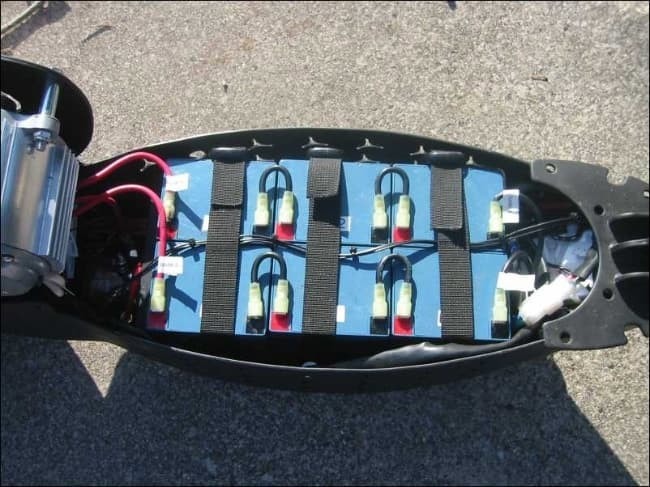 If the battery is the lead-acid type and contains liquid, check the electrolyte (the fluid) level in all chambers and on the front of the scooter battery check the fill level in all the cells. The level in all chambers should be slightly below the high fill line. If the level of the electrolyte seems to be much lower, you should fill the cells with de-ionized water. To fill them, use a pair of pliers to pull off the filler cap. There are some filler caps that will put out straight while some are usually threaded and therefore you will have to twist them in the indicated direction. Before filling the cell, check inside for any excessive sulfation and sediment. Your tap water may contain minerals that can reduce the life and effectiveness of your battery, so don't use it! After filling the battery replace all the filler caps. If for any reason the battery was severely discharged, you should use a scooter or battery charger and avoid using battery chargers above 2 amps current rating. 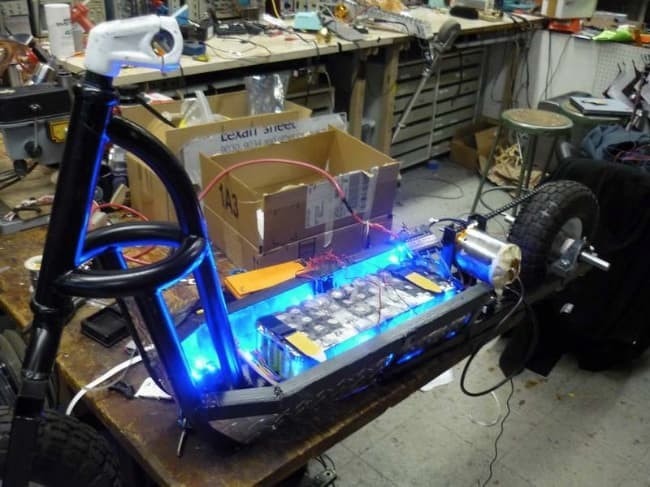 Always ensure that the charger is set on the right voltage for the battery (either 6V or 12V or 36V and even 48V in the case of some of the high powered adult electric scooters like the 1200W Super Turbo Electric Scooter). Anytime the battery is out you should remember to check the fuse in your scooter. Mostly, the fuse will be held in a clip on holder on the left hand side of your battery platform. You should replace any blown out fuse before you can install the battery. Check whether the fuseholder is corroded or has rust on its inside or outside and replace it if necessary. You should reinstall the battery in reverse order to the instructions above ensuring that the overflow tube is in the right position. Check the clamps, cables and the case for any damages or loose connections. Replace a broken rubber strap and clean corroded wires using carb cleaner or wire brush. To replace a battery connector, you should get a similar one from the local scooter shop. Test the battery with voltmeter or hydrometer. Storing a scooter battery can be a tricky task. As a matter of fact, a battery that isn’t used for a long time will hardly hold a charge. You should always place your scooter in a place which is above freezing temperature. 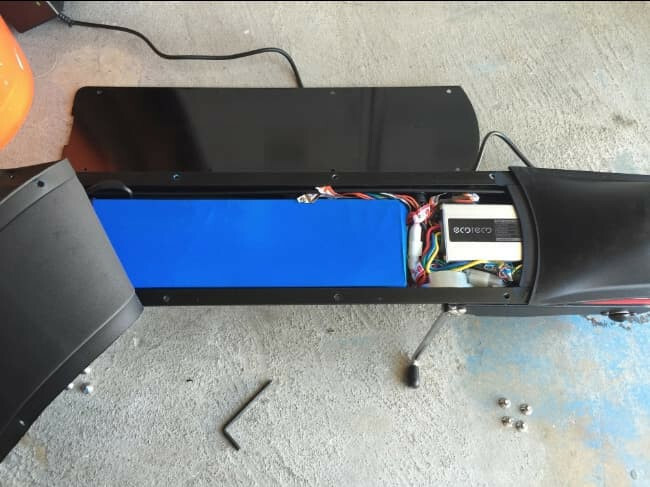 When leaving it outside, remove the battery and store it in a location which is warmer. This will prevent your battery from freezing and cracking. Anytime you remove the battery from your scooter, you should avoid placing it on a metal or concrete surface. Instead, you should place it on non-conductive surfaces such as wood. A battery placed on metal or concrete will discharge with time. You should also remember to place a charger or tender on the battery. To increase the life of the battery, trickle charge at least once in a month with a reliable battery tender. I hope that you have enjoyed reading this article about how to look after and maintain your e-Scooter battery. Of course, if it's a bit too late and the battery is already dead you can watch the handy video below for how to change the battery on a Razor E175 kids electric scooter! A well cared for electric scooter battery can last a few years so this maintenance guide gets a 5 star thumbs up!